In the previous post I explained that I have yet to write a couple of posts about a few sightseeing places hubby and I visited in 2013. 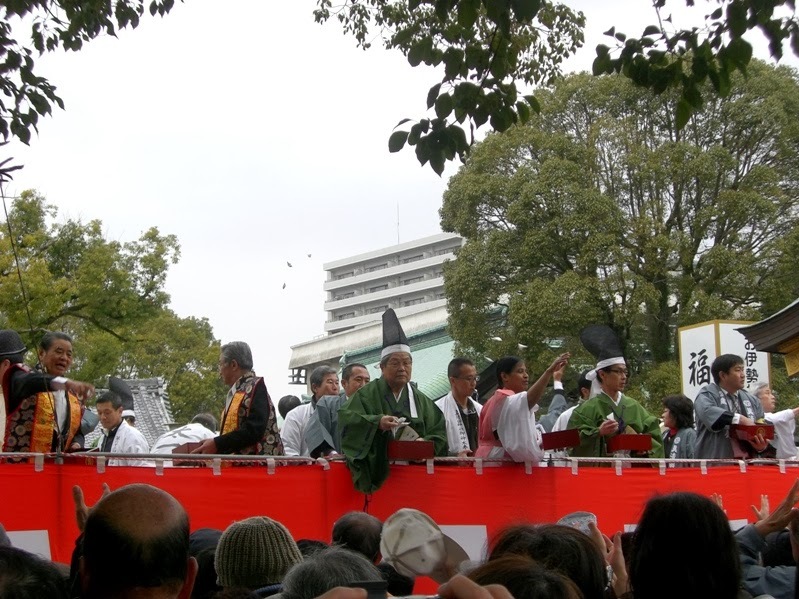 But I decided to write today about Setsubun festival that I attended last week. I will get back to the pending posts from 2013 later on. Hubby had been on a business trip to USA at the end of January. He went there for almost 10 days and I did not feel like staying in the extremely cold snowy Akita all by myself. So I went to stay at our home in Ichinomiya City in Aichi prefecture during those days. 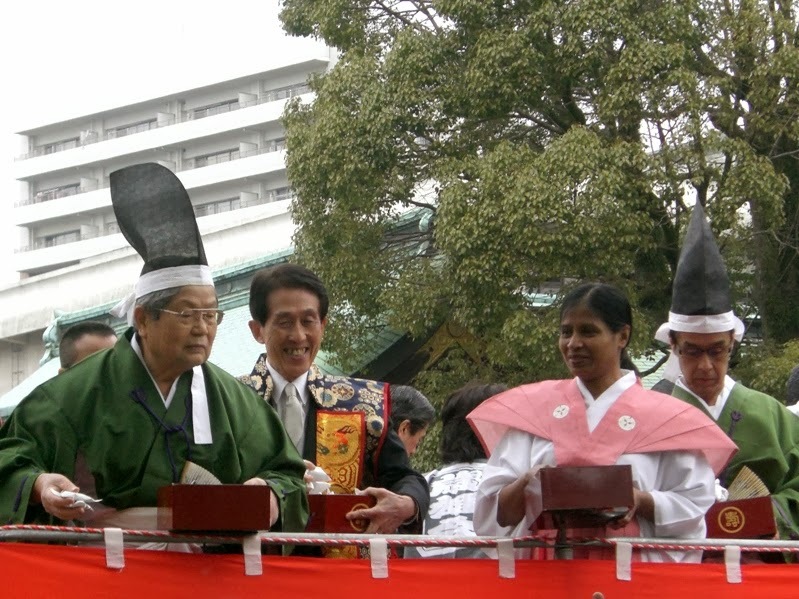 My in-laws stay nearby and my father-in-law registered my name as ‘Fukume’ for a festival named Setsubun held at Masumida Jinja Shrine in Ichinomiya City on 3rd February. Setsubun is a festival usually held on 3rd or 4th February, one day before the start of spring according to the Japanese lunar calendar. It is a traditional ceremony to dispel evil and demons and bring good luck that year. The term Setsubun originally referred to the eve of the first day of any of the twenty-four divisions of the solar year known as Setsu. Later it was applied more specifically to the last day of the Setsu called Daikan (severe cold), which corresponded to the eve of Risshun (the first day of spring), the New Year's Day of the ancient solar calendar and the traditional beginning of spring. 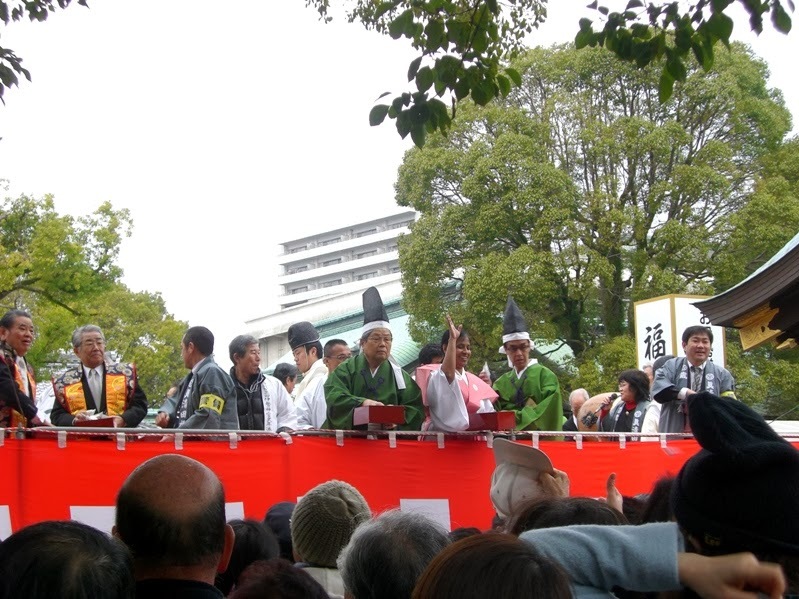 Since Risshun and the traditional New Year celebration fell at about the same time, Setsubun was associated with rites of purification and exorcism of evil deemed essential to preparing oneself for the coming year and the spring planting season. 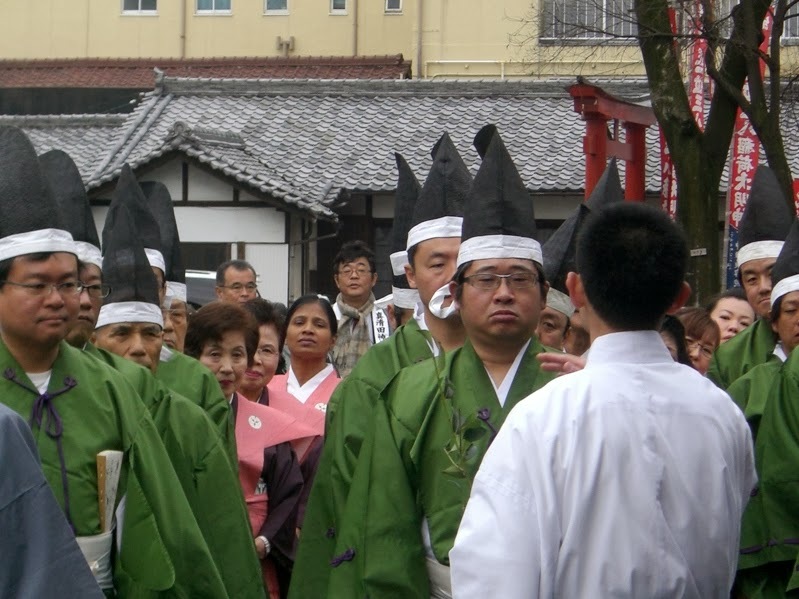 For many centuries, people of Japan have been performing rituals with the purpose of chasing away evil spirits at the start of spring. 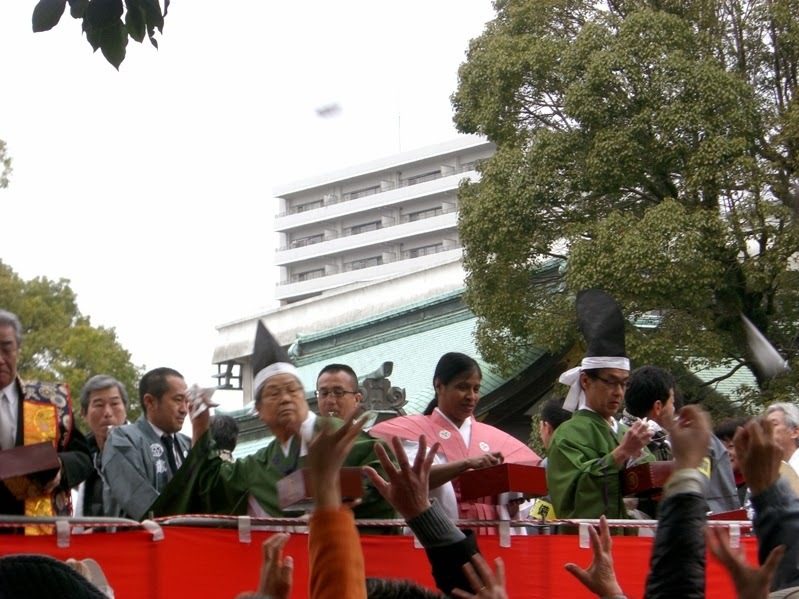 Setsubun is such a traditional ceremony to dispel evil, and is usually associated with the special ritual of Mamemaki or bean-throwing, which is said to date from the Muromachi period. This rite is linked to the observance of Tsuina, a Chinese ceremony for driving off devils dating from the Zhou dynasty (1046-256 BCE). This Tsuina rite was adopted in Japan by the mid-ninth century by incorporating it into the cycle of annual events observed by the imperial court, and from the Muromachi period it came to be enacted at Setsubun. 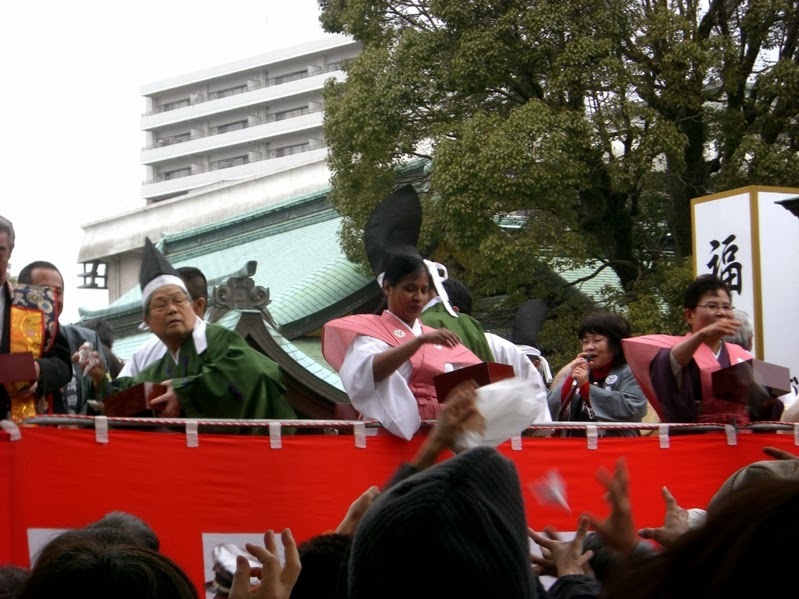 In modern days, Setsubun is celebrated in many ways but Mamemaki ceremony of scattering soybeans is the most common custom throughout Japan. On the day of Setsubun, many households carry out this custom of Mamemaki. A wooden measuring cup called Masu is filled with parched soybeans called Fukumame fortune beans. The head of the family then throws the beans all about the rooms in the house, shouting ‘Oni Wa Soto, Fuku Wa Uchi’ meaning ‘out with the demons and in with fortune’. They also open the windows and doors, and throw the beans outside. 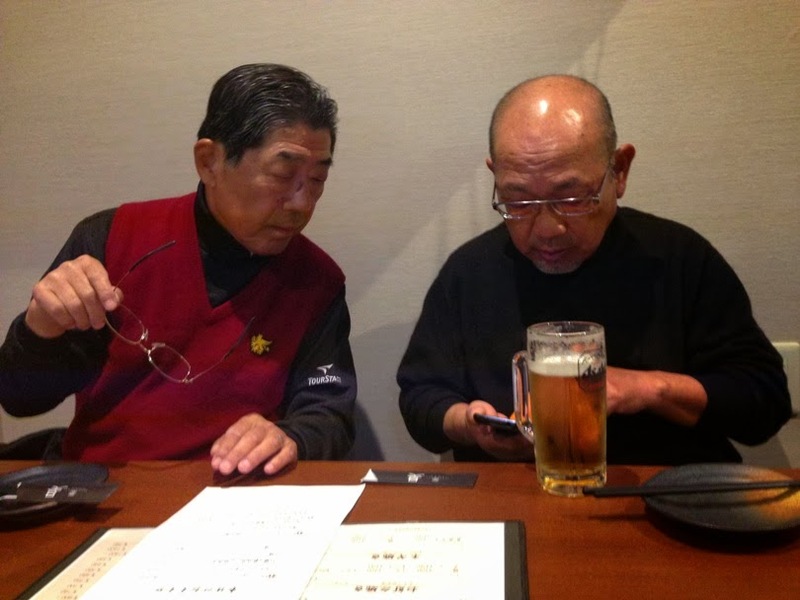 It is customarily believed that family members can be healthy and happy if after the ritual of throwing Fukumame beans, they pick up and eat the same number of beans as their age. 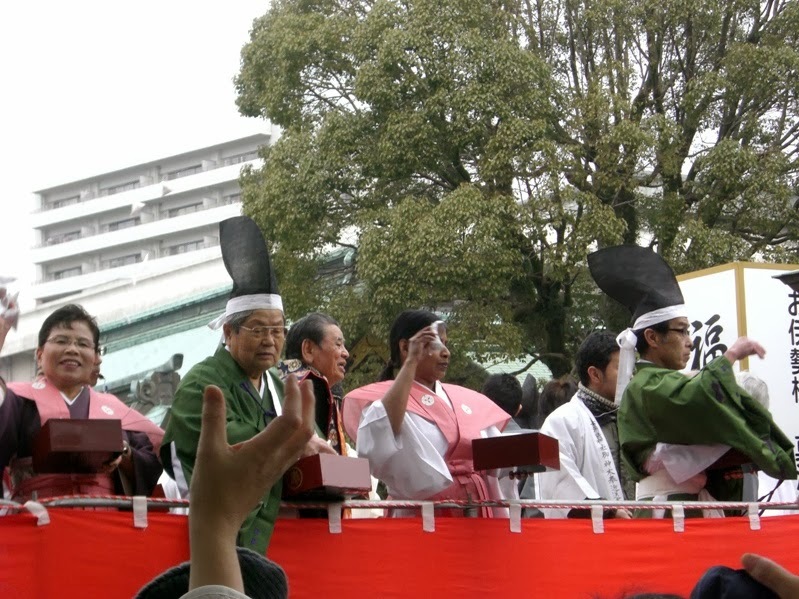 There are a few other variations of celebrating Setsubun throughout the country. In some areas, people fix a branch of a holly, on which is stuck a head of grilled/dried sardine, to the door to drive out evil spirits. While in some areas, it is customary to eat fortune sushi rolls called Ehomaki facing the lucky direction without talking. 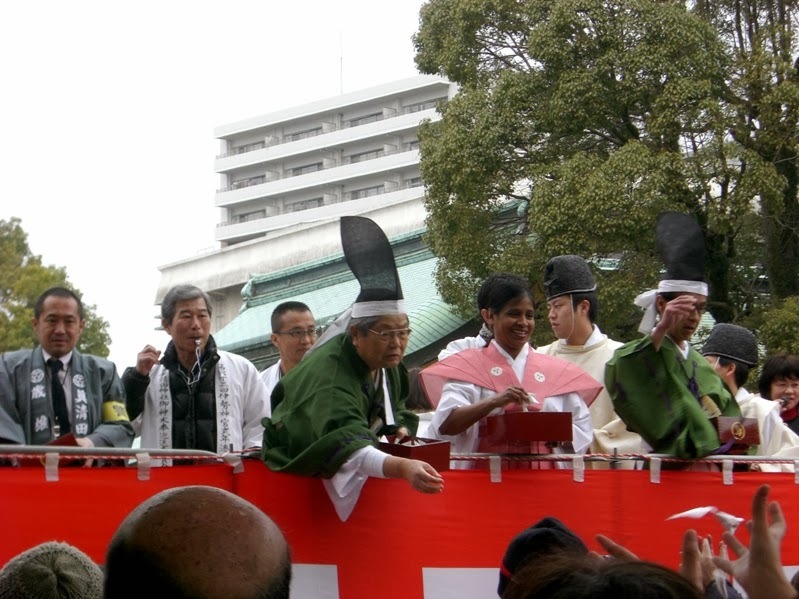 Also, in modern times, there are Setsubun celebrations at Buddhist temples and Shinto shrines all over the country, and people visit there to pick up beans and to receive good fortune. Such celebrations are held on a much bigger scale than the household celebrations. 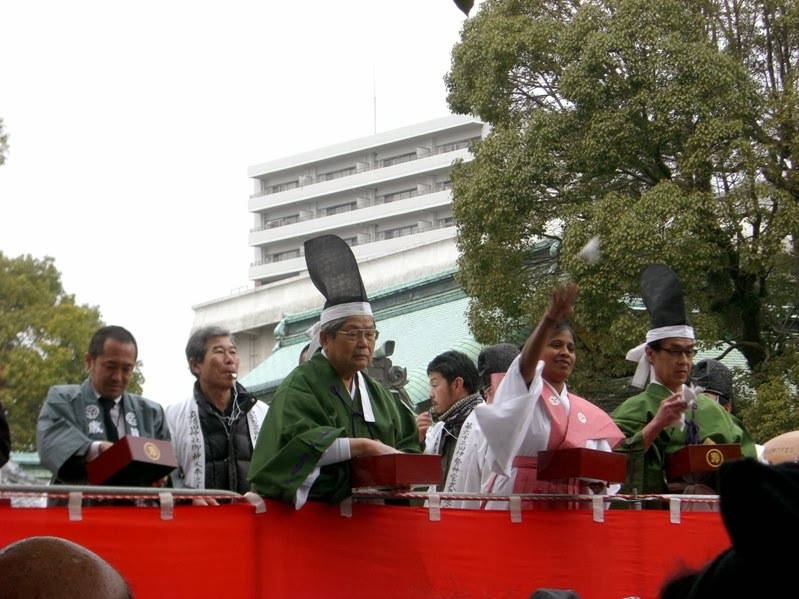 Priests and invited guests throw parched Fukumame soybeans, often packaged into cute tiny paper envelopes, at the waiting crowd. 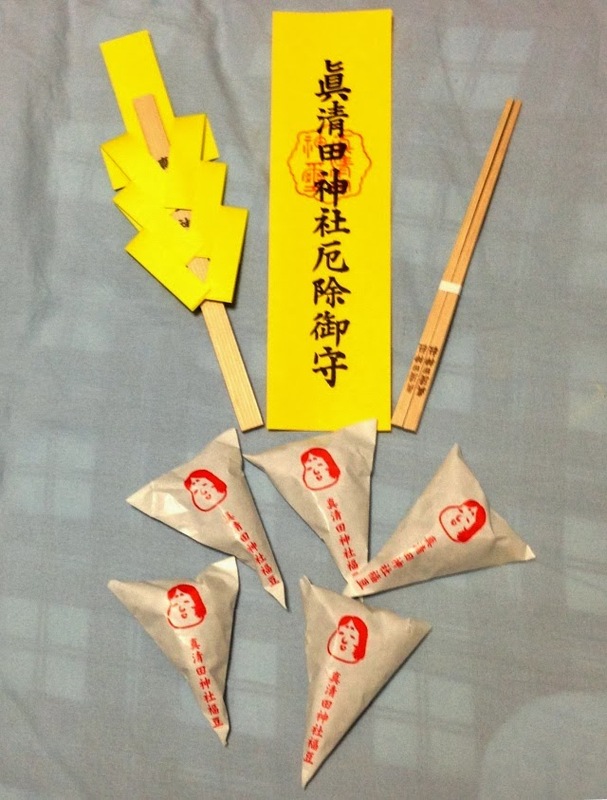 Sometimes small envelopes with money, sweets, candies and other prizes are also thrown at the crowd. 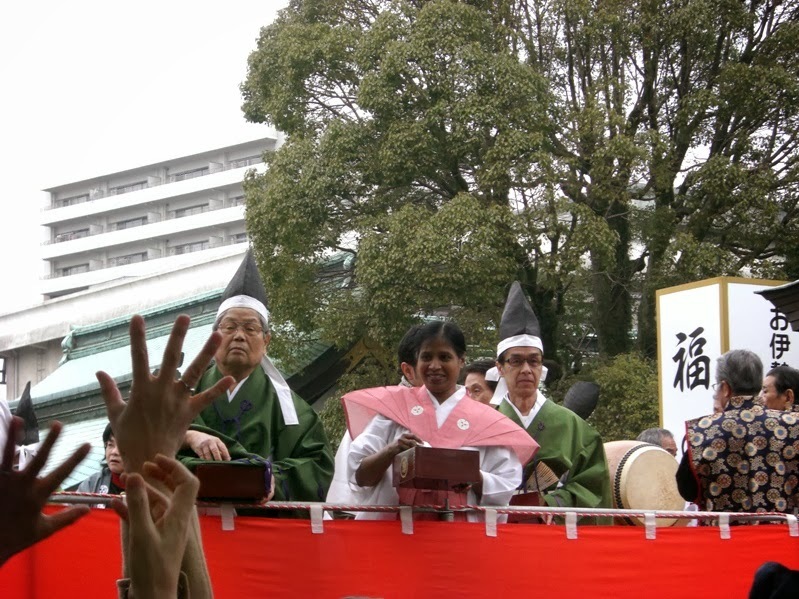 In some prominent shrines and temples, celebrities, movie stars, baseball players, Kabuki players, Sumo wrestlers, and other popular personalities are invited who participate in Mamemaki bean-throwing ritual. They stand on a stage and shower beans and other goodies at the waiting crowd. Sometimes the event turns wild with everyone pushing and shoving to get the gifts tossed from above. I feel that inviting popular personalities for such celebrations is a means of soliciting visitors to the temples and shrines. 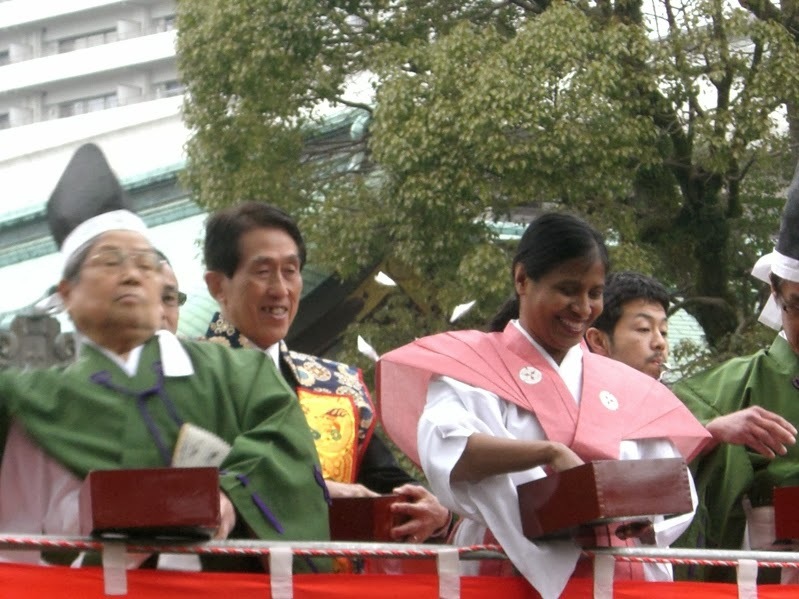 In mid-January, my father-in-law had registered my name and arranged for me to be one of the ‘Fukume’ women for Setsubun celebrations held on 3rd February at Masumida Jinja Shrine in Ichinomiya City. 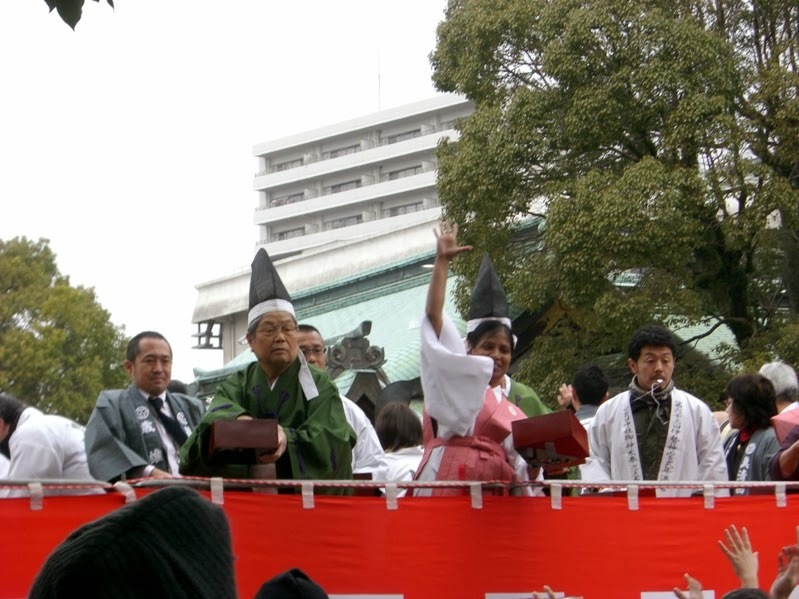 During Mamemaki bean-throwing ceremony, Toshi-Otoko (men born in the year with the same zodiac animal sign), Toshi-Iwai (men of auspicious ages 61, 70, 77, 80, 88, 90 years old and above), and Fukume (fortune spreading women) stand on a temporary stage built in front of Haiden Prayer Hall of the shrine, and throw Fukumame fortune beans at the waiting crowd. This year, nine Toshi-Otoko men, six Toshi-Iwai men, and eight Fukume women were selected for the Setsubun celebrations at this shrine. 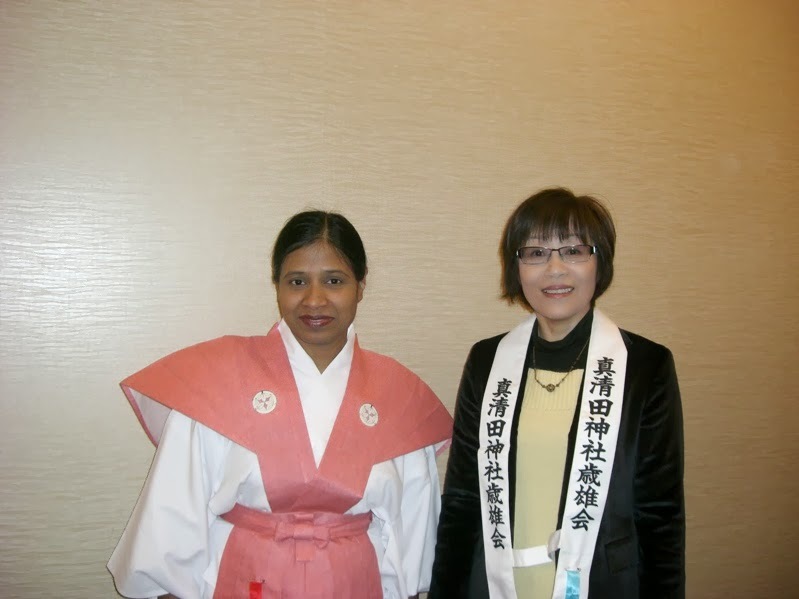 As I wrote earlier, I was one of the Fukume women. In addition, Kato Noriko who is an actress, singer, and a television personality was invited as a special guest for Mamemaki ceremony. 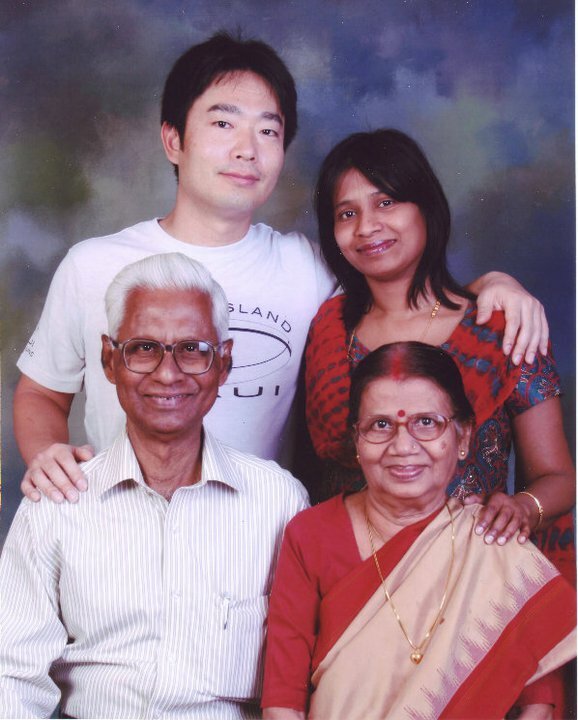 On the morning of 3rd February, my father-in-law, his wife and I started from our home in Ichinomiya at about 8.45 am. Masumida Jinja Shrine is located about 4.5 kilometers east-southeast of our home, and it took us about 15 minutes of car ride to reach the shrine. At the shrine, I went to a dressing room where Fukume women were getting dressed in traditional formal wear for Setsubun celebrations. 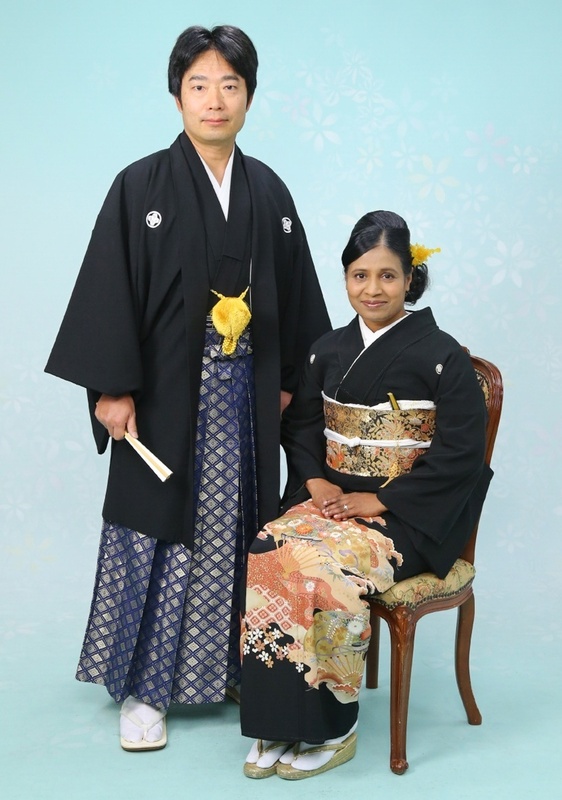 My father-in-law’s wife accompanied me as I was not aware of how to wear the traditional clothes. 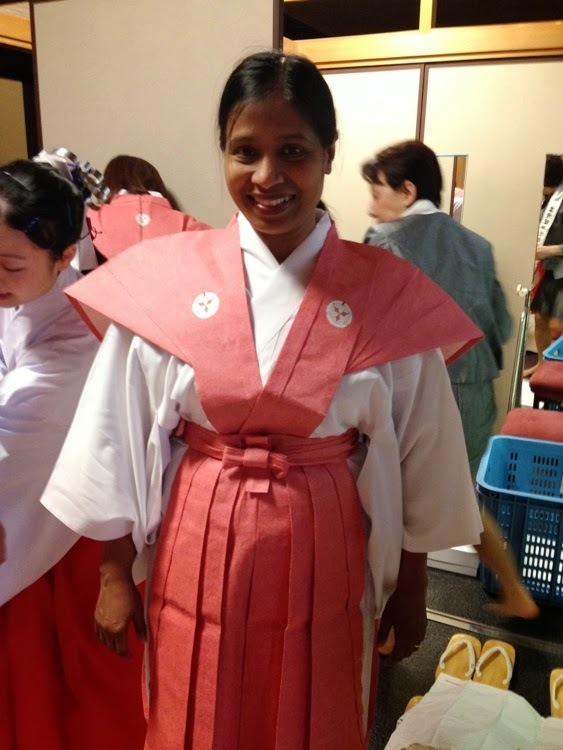 Fortunately, a female shrine staff called Miko helped me in wearing the traditional wear. 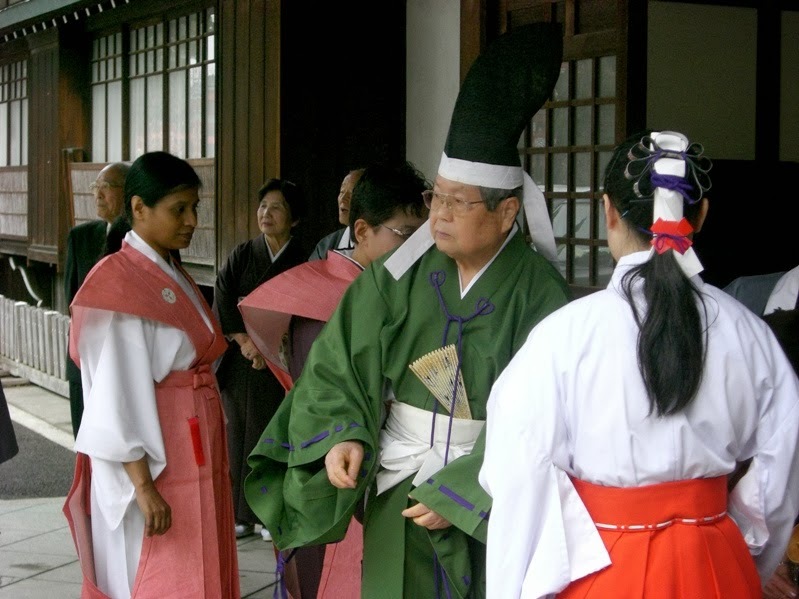 The traditional wear was provided by the shrine itself, and consisted of a white Kosode Kimono and a pink Kamishimo worn over the Kimono. Kamishimo consisted of a pink-colored sleeveless jacket called Kataginu having crisp, exaggerated angled peaks at the shoulders, and a matching pink-colored trouser-like split skirt called Hakama which is wide and pleated. I also wore white colored Tabi socks that I had borrowed from my father-in-law’s wife. 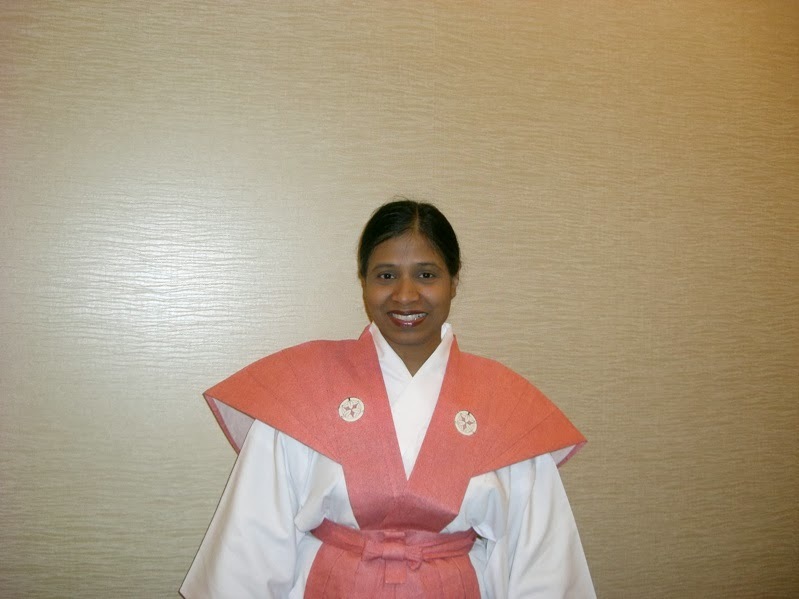 I was really very happy to wear Japanese traditional formal wear and took a few photos of me in such wonderful attire. 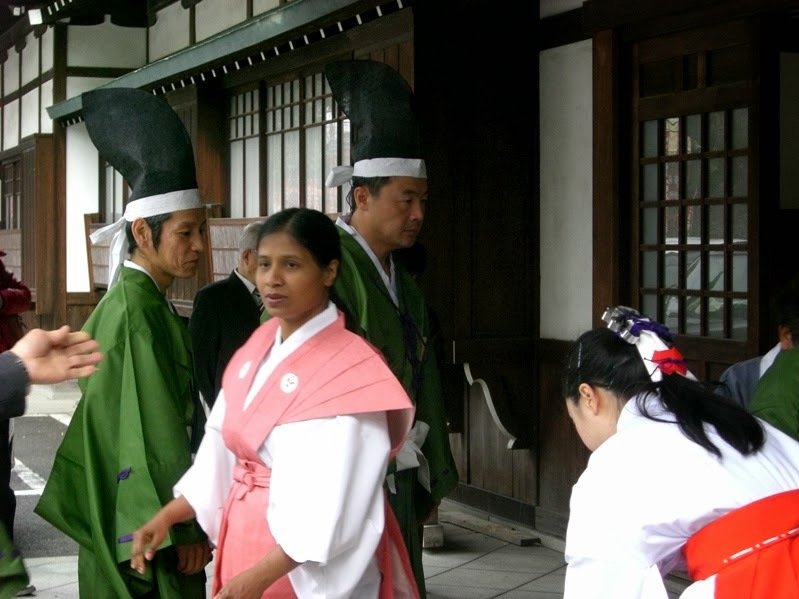 Afterwards all the Toshi-Otoko, Toshi-Iwai, and Fukume dressed in traditional wear were told to walk up to the side entrance of Honden Main Hall of the shrine. Up to this point my father-in-law’s wife was with me. She wished me luck to do my best, and then went with my father-in-law and their friends somewhere. 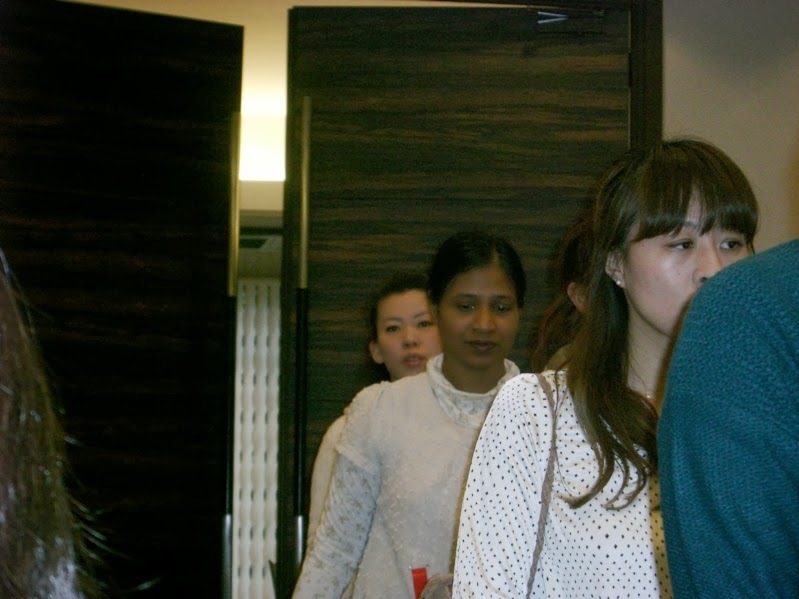 We, the Toshi-Otoko, Toshi-Iwai, and Fukume, stood in a queue and waited for our turn to wash our hands at a hand washing basin located adjacent to Honden Hall. A shrine staff and a Miko helped us with the procedure. Washing our hands with water is supposed to purify us before entering the main hall. 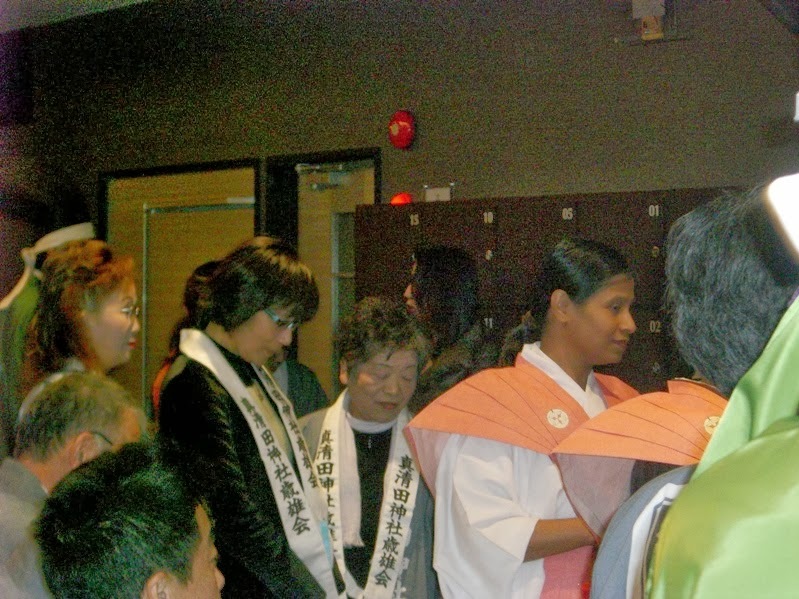 Near the hand washing basin, I saw Kato Noriko, special guest for Mamemaki ceremony, standing and posing for photos. 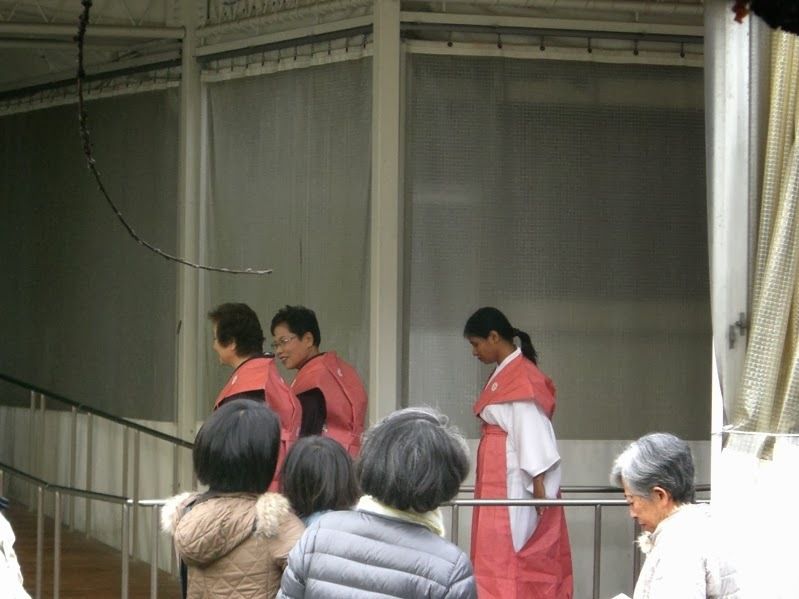 Next, at about 10 am, a shrine staff led us inside the Honden Main Hall of the shrine where we all Toshi-Otoko, Toshi-Iwai, and Fukume dressed in traditional wear sat on the left side of the stage of the hall just in front of the raised altar where the deity is enshrined. Several priests sat facing us on the right side of the stage of the hall. The principal deity of this shrine is named Amenoho Akari no Mikoto, who was a descendant of Amaterasu, and the ancestor of Owari clan, the prehistoric rulers of the area. 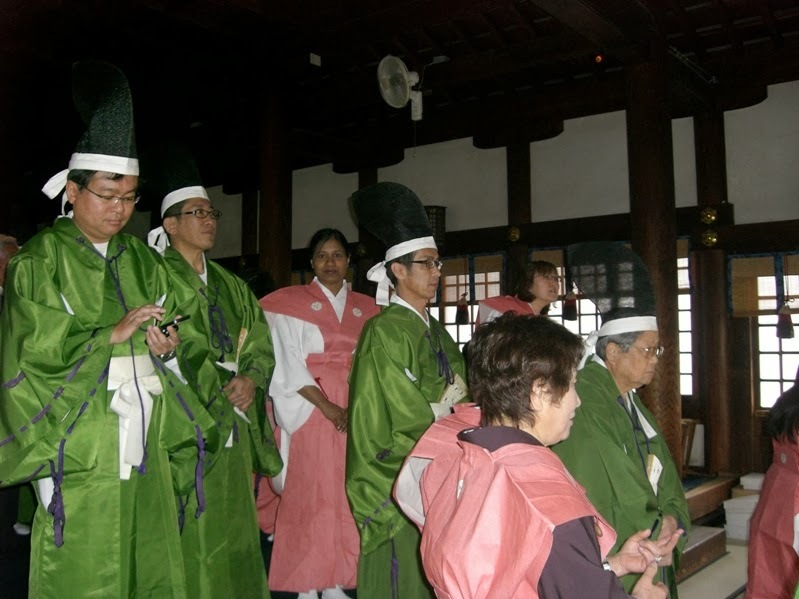 Many rituals and prayers were carried out by the head priest and other priests. We also performed a ritual named Tamagushi, which is a form of offering made from a Sakaki tree branch decorated with Shide strips made generally of Washi paper. Earlier while waiting for the ceremony to begin, we were given a quick lesson about how to hold and offer Tamagushi to the deity. I had absolutely no idea about such things but was relieved to note that almost all other Toshi-Otoko, Toshi-Iwai, and Fukume were equally unaware of the procedure. But during the actual prayer ceremony, several of us still made a few minor errors while placing the Tamagushi offering in front of the deity. I am sure that the god forgave us as it was probably the first time for many of us. 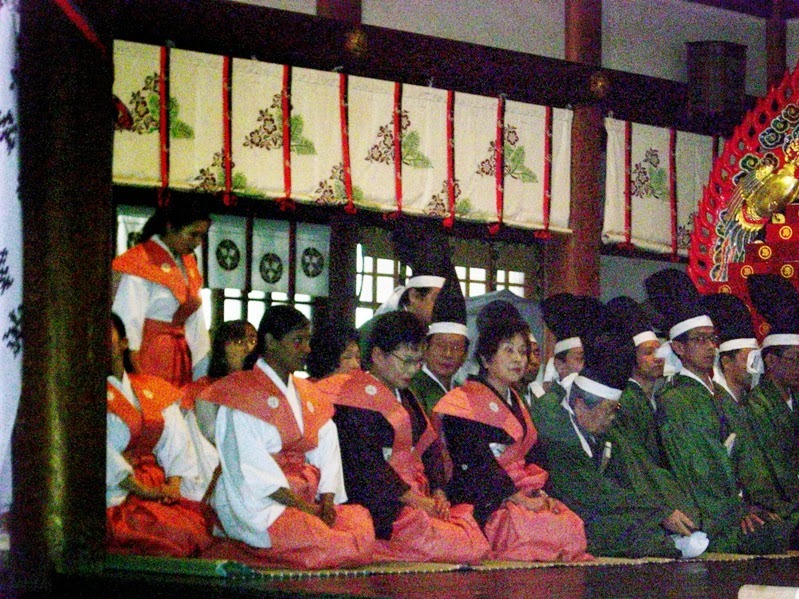 Anyway, the entire ceremony and prayer rituals took almost an hour and we had to sit in the formal Seiza style. While the Japanese people are quite used to sitting in such a formal way, my leg got numb after about 40 minutes of sitting that way. A shrine staff noticed my uncomfortable situation and told me that it was ok to sit in a more relaxed way, as the main prayer was already over. It was really a relief for me. 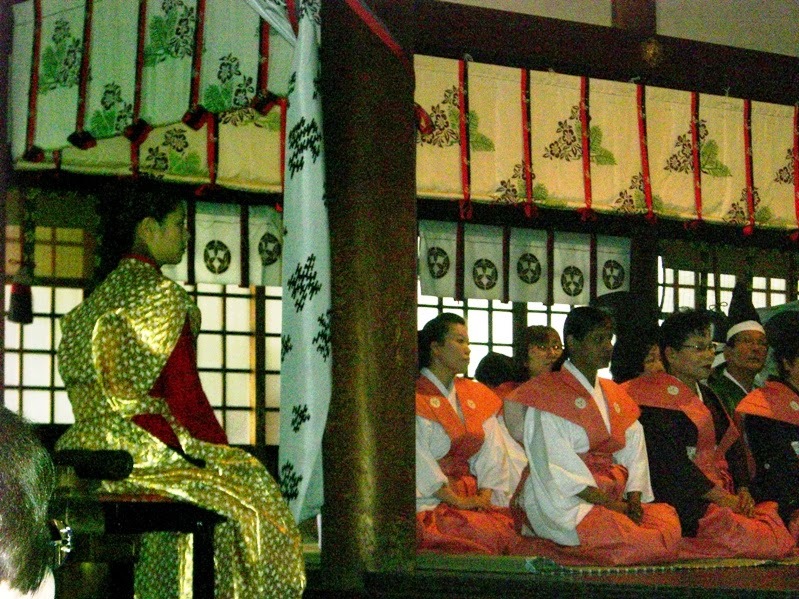 After the prayer ceremony and rituals inside Honden Main Hall got over, we Toshi-Otoko, Toshi-Iwai, and Fukume were led to Haiden Prayer Hall located in front of Honden Main Hall. 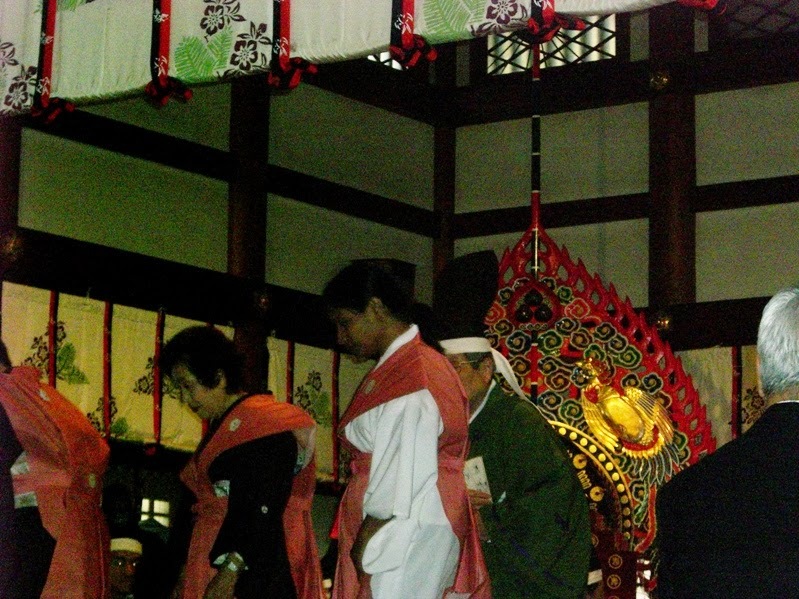 A temporary wooden platform stage was erected on the ground in front of Haiden Prayer Hall for the Mamemaki ceremony. While waiting inside Haiden Hall, we could hear the sound and feel the energy of the gathered crowd eagerly looking forward for the Mamemaki ceremony to begin. We Toshi-Otoko, Toshi-Iwai, and Fukume were divided into three groups, and I was in the first group. 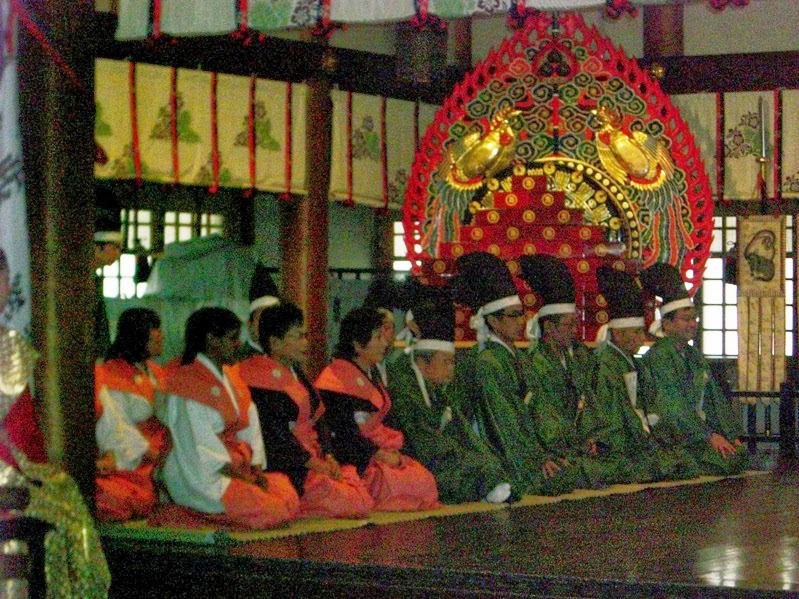 The first group climbed up the stage and waited for the Mamemaki ceremony to begin. 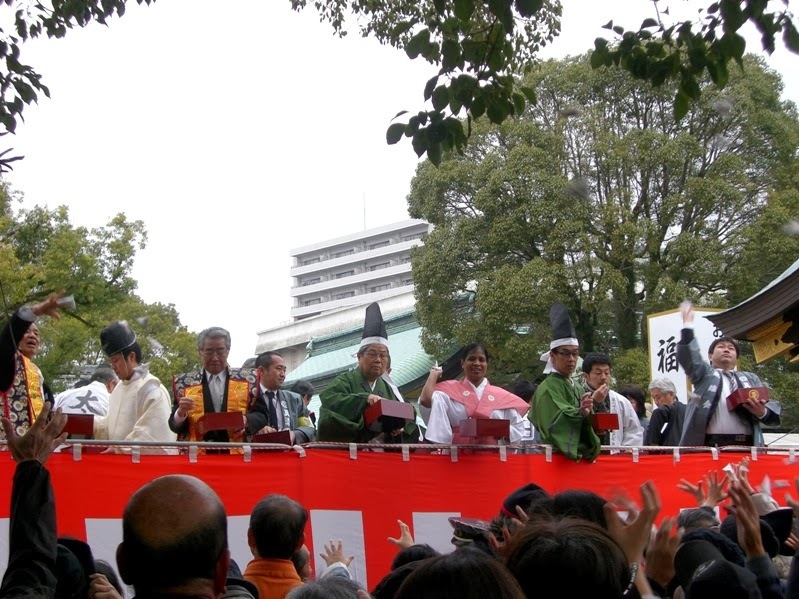 Several priests, important or prominent members of Ichinomiya City, and the special guest Kato Noriko were already standing on the stage. 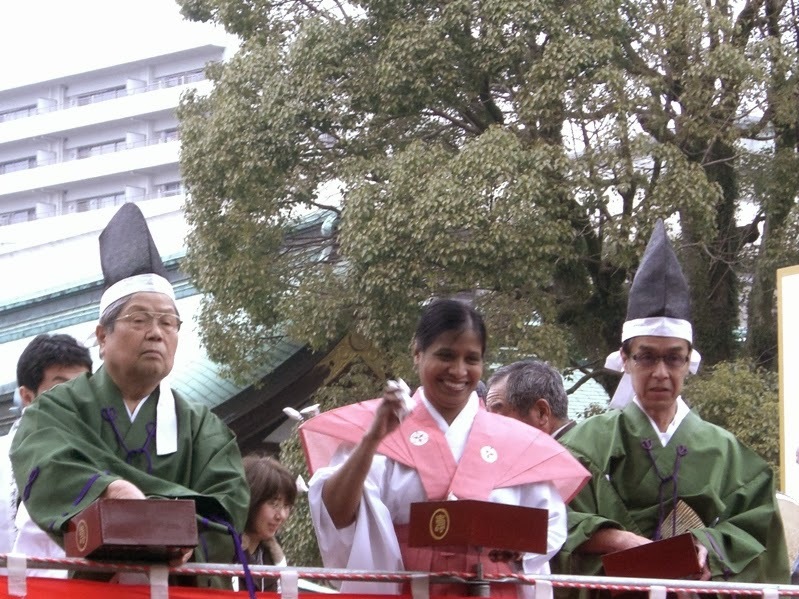 A shrine staff whistled loudly with a whistle, which was the signal for the start of Mamemaki ceremony. It was really fun to pick up Fukumame fortune beans packaged into cute tiny paper envelopes from a big wooden Masu like box and throw them at the waiting crowd. Whenever the wooden box I was holding got empty, a shrine staff immediately replaced it with a new box full of Fukumame paper envelopes. As the event progress, I saw that the crowd in front of me got really wild and started pushing and shoving to get the Fukumame beans. In a way, I felt good to see that even Japanese people push and shove! Anyway, picking up Fukumame beans and throwing them at the crowd was really exciting. It was fun to do it again and again. Standing on the stage, I got an opportunity to talk with the Mayor of Ichinomiya City Mr. Tani Kazuo. There was a whistle after ten minutes, which indicated the end of Fukumame beans throwing for the first group. Those ten minutes were probably the best unforgettable moments of my life in Japan until now. 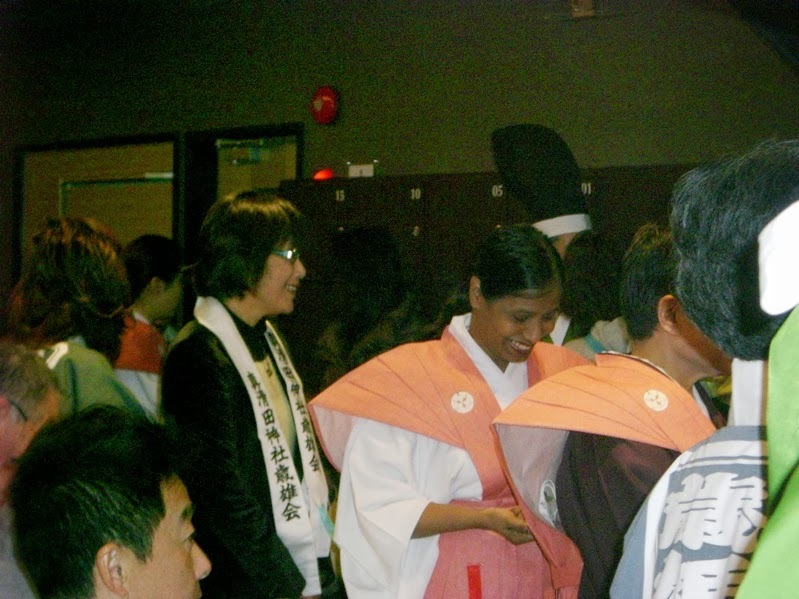 The first group got down the stage and the second group climbed up to continue the Mamemaki ceremony. The entire ceremony continued for 30 minutes. Afterwards, I returned to the dressing room and changed into my usual clothes. 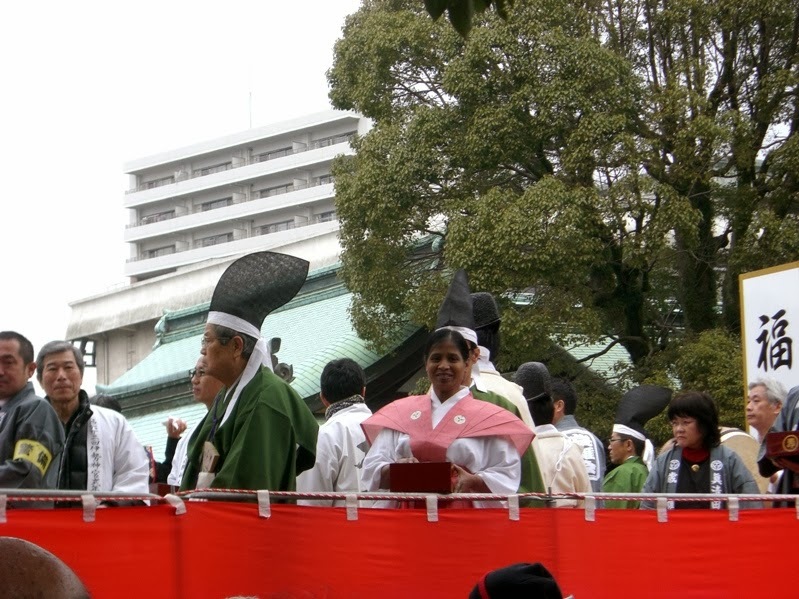 At about 12.30 pm, there was a formal lunch inside the shrine premises. 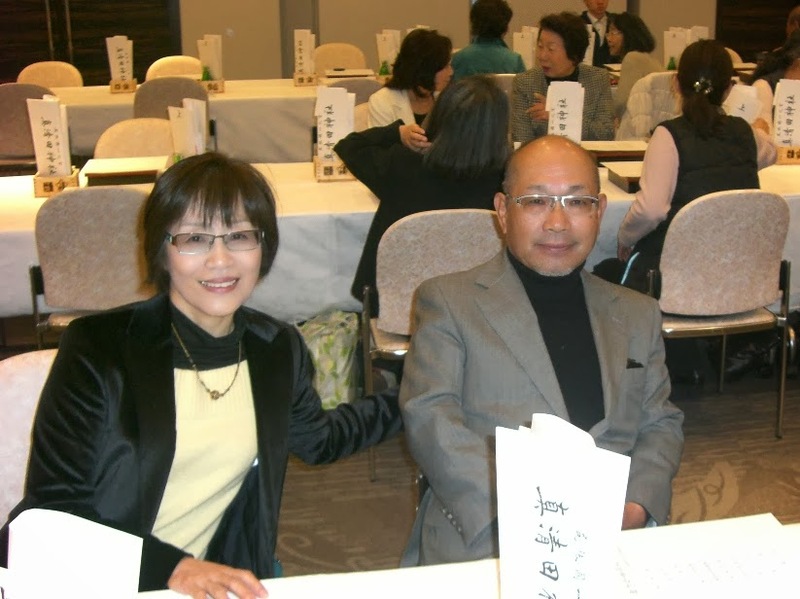 At first all the invited guests (including my father-in-law and his wife), a few priests, and prominent members of Ichinomiya City were seated at their tables. Then, we the Toshi-Otoko, Toshi-Iwai, and Fukume entered the room amidst applause and cheers from all the seated people. 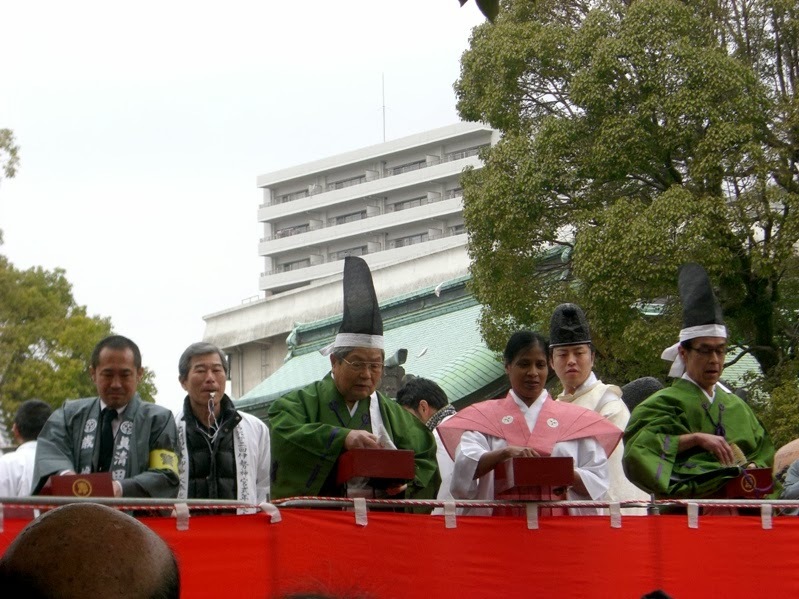 The head priest and a few prominent persons gave speeches, and then we had a nice lunch. We also got a few shrine-related items and five paper envelopes containing Fukumame beans as gifts. It was really nice. 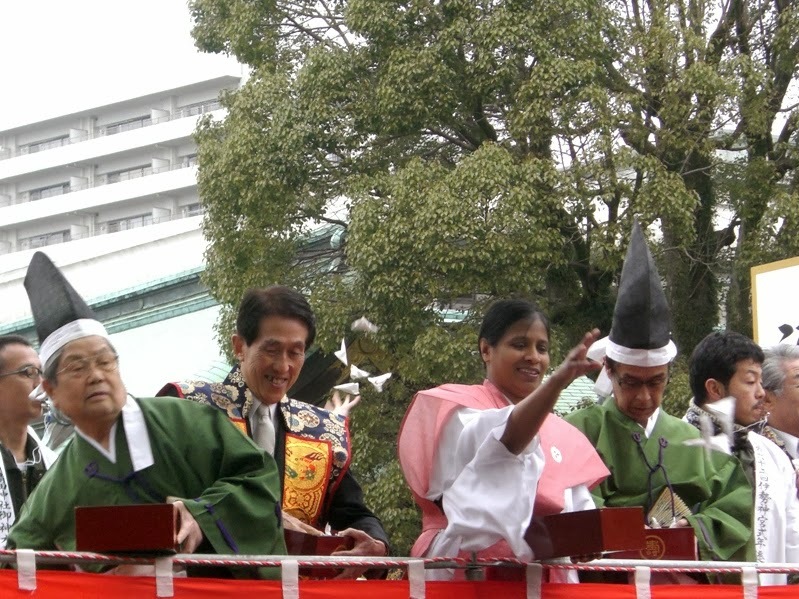 I really enjoyed Setsubun bean-throwing festival held at Masumida Jinja Shrine in Ichinomiya City. I stayed in Ichinomiya for 10 days. 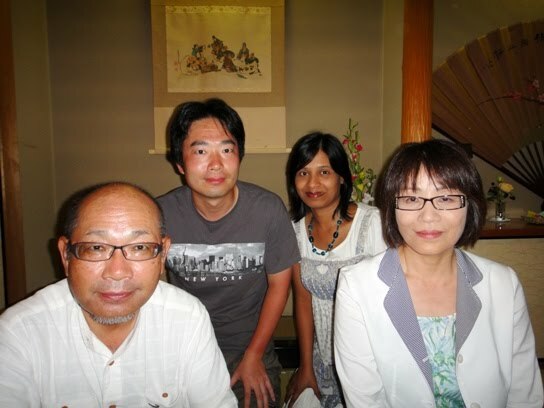 One of the days I had dinner with my father-in-law, his wife, and his older brother at a Japanese style restaurant. It was fun to talk with them. 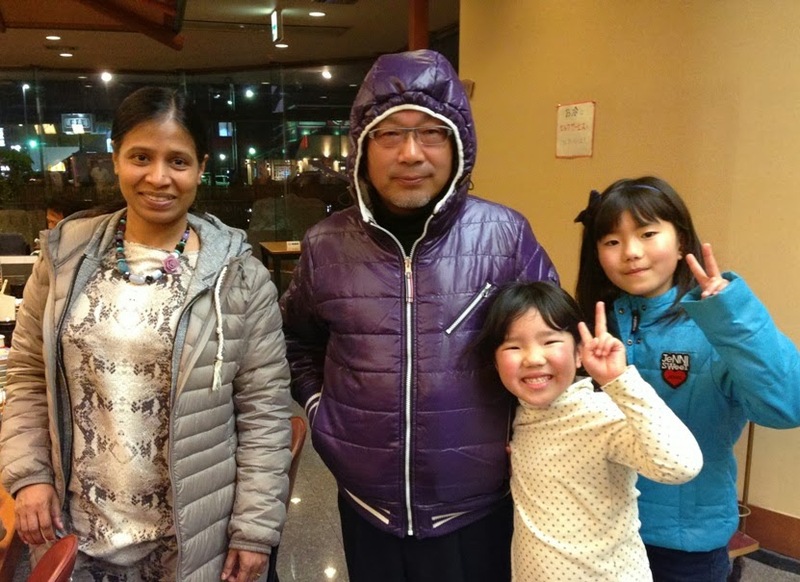 Yet another day, I had dinner with my father-in-law, sister-in-law and her daughters at a Sushi restaurant. 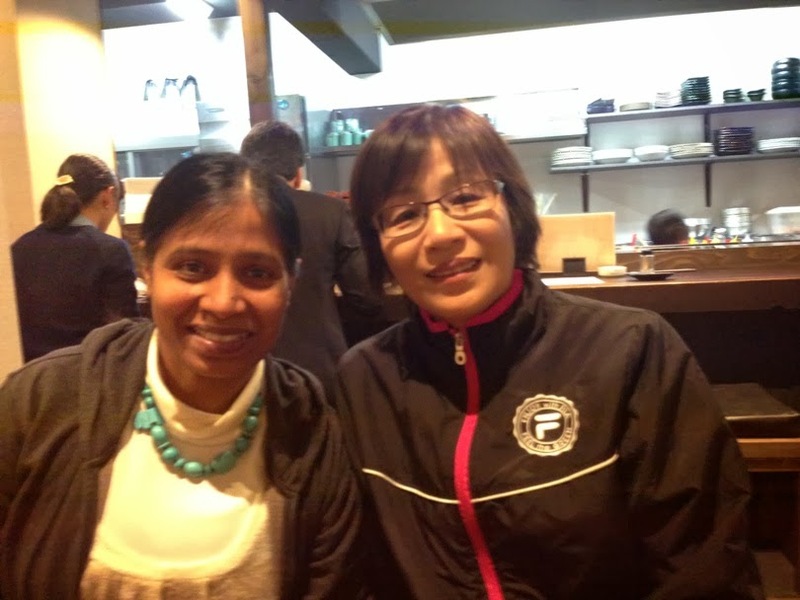 It was nice to talk with my sister-in-law after a long time.